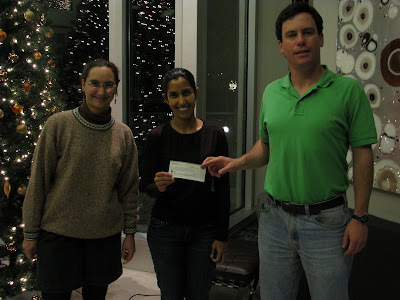 After a very successful 2009, Nathalie Criou, President and Nathan Bossett, CFO, of BeatSarcoma presented Dr. Amreen Husain, associate professor of Gynecologic Oncology at Stanford University a $30,000 research gift to further her efforts around sarcoma research. 'We are pleased to contribute to local research institutions and help stimulate professional interest and research around sarcoma-related problems. Independent and fresh ideas are critical to successful research outcomes' says Criou. The current knowledge of sarcoma is so scarce that any discovery is a home run - and represents a huge improvement over the current knowledge base. 'The sarcoma team at Stanford Cancer Center thanks BeatSarcoma for its continued support and applauds its efforts to raise public awareness of this challenging disease.